Radiohead has just done its second all-digital album release, a day earlier than expected. The band was one of the first popular acts to experiment with a digital-only release. In October 2007, Radiohead released “In Rainbows” as an download-only album and allowed customers to set their own prices. The band bypassed Apple’s iTunes and other traditional digital stores, and instead sold it directly, using a private network from PacketExchange to help keep the bits flowing. 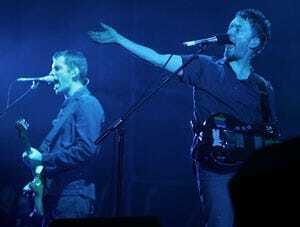 The experiment worked: Radiohead said it made more money from the download — even though a third of the people who downloaded it paid nothing — than it did from the sales of its previous album, 2003’s “Hail to the Thief.” The experiment also generated a lot of hype for the eventual release of “In Rainbows” on CD and other formats — the album eventually sold more than 3 million copies, which is a huge amount in this age of declining CD sales. This time, “The King of Limbs” comes in two formats — a digital-only version that costs $9.99 for the MP3 or $14.00 for the better-quality WAV files, or a “newspaper” format that lets users download the album now and then receive a package including LPs and artwork via mail a few weeks later. Once again, Radiohead is bypassing iTunes, which allows the band to keep more money from each sale.